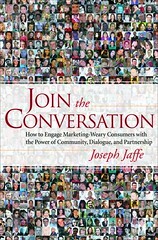 I purchased Jaffe's Join the Conversation book when it came last October, 2007 when I first heard about it. I've been a fan of Joseph Jaffe's blog for a while, so when I first heard about it. While he is writing for a corporate and for-profit audience, he makes some compelling points about why marketers must adapt to the brave new world of social media. Chapter 18 was particularly valuable to me -- "Getting Started: The Manifesto for Experimentation" and his approach to "ROE" or return on experimentation. Which will get you to ROI. 2.) I'll select a winner -- I'll write a blog post about you and you'll get a book! I would love to be considered for the book. 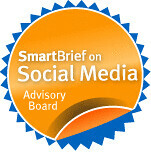 I am an avid student of social media. I am involved with helping both for profit and non- profits navigate this constantly changing terrain. I am also a regular reader of Joseph's blog and am very interested in learning more from him. Beth, great idea. Though I've heard a good bit about the book, and thoroughly want to read ALL of it, I'd like the book to give to a new co-worker (ie my boss) as part of a larger introduction to the market of conversations (cluetrain manifesto may be too much to start with). I signed up to get your blog through one of the networking contests...and have very much enjoyed the information and suggesstions for improving our networking using the web. I am so excited to learn and hopefully use all these wonderful ideas to expand the support for our little non profit. I work for Community Opportunities Inc...we are an agency that creates opportunities for developmentally disabled adults and teens. If it is something that will improve their quality of life...we try to do it. I hope you will consider me for the copy of this book, I feel that everything I can learn and use will only help to further us with our mission. I wasn't familiar with Jaffe's work until I read about this book on your blog. As someone with a traditional media background in radio & newspapers, I dipped my toe in the social media stream last summer and now feel like I've waded in up to my knees. I have been fascinated by the way relationships are formed through social media. It used to be that you would meet someone in person, then connect with them online through email & a static website. Now, I've been connected first with people online and then meeting them in person or speaking over the phone. My hope is to use social media to help small businesses connect with non-profits for long-term, mutually beneficial relationships. Jaffe's book seems to address that need and I look forward to reading it.